Get your A/C checked at a local shop or check it yourself? Freon will need to be added by someone. Summary ©DenLorsTools.com: Adding freon or topping off a cars A/C system is the most common task performed to restore performance and get cold air blowing again. 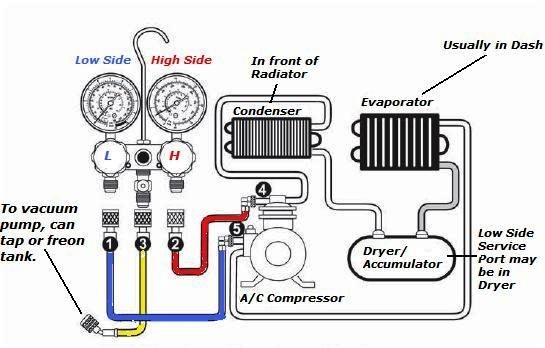 However, adding refrigerant isn’t always the solution for car air conditioning problems – troubleshooting may be required before just charging a car AC system. There can be many other things wrong besides a system being low on refrigerant. To diagnose/troubleshoot problems, an A/C manifold gauge set is needed to read high and low side pressure readings. 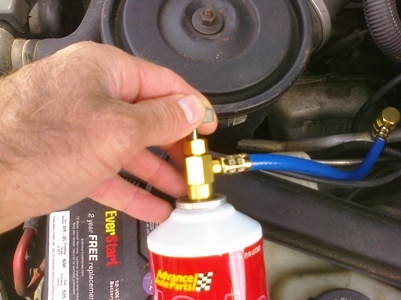 Avoid adding refrigerant with a simple charging kit like the ones sold at parts stores. Don’t add any stop leak, this can cause problems in the compressor, expansion valve or condenser. The image above was taken at Moog and US Hwy 19 in Tarpon Springs Florida, it made me laugh. The sign says “Your wife is hot! 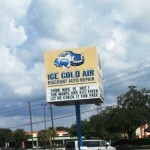 She wants her A/C fixed, let us check it for free”. For some help taking care of your AC problems yourself continue reading. This is where it starts to get serious. Keep in mind that using an A/C gauge set and seeing BOTH high and low side readings can help in diagnosing the problem when you know what to look for. First, on a 134A system the high and low side service ports are different sizes. AC gauge sets have color coded hoses, the blue color coded hose has a connection that fits on the low side service port and the red hose has a connection that will only fit onto the high side. 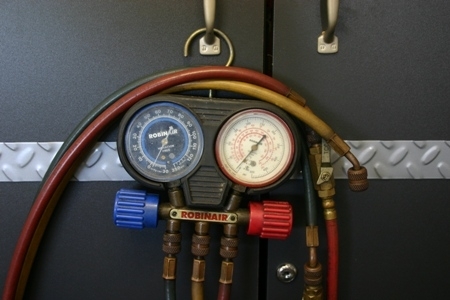 The yellow hose won’t hook up to anything if just checking the readings; it can be used to connect to a vacuum pump or attached to a refrigerant can or tank. *Make sure the condenser fan comes on when the readings are being checked. Below are normal car AC pressure readings with 134A. the high side valve has a slight leak. When i fill the system and put the cap back on it builds pressure and blows the cap off? the air is actually cool while this is happening? It will cool until enough refrigerant leaks out that it cannot. I’d try tapping on it slightly to see if the valve stops leaking. If not it will need to have the refrigerant recovered, the valve replaced and the vacuumed down and recharged. To check each side requires different fittings and gauges. High and Low. Good Luck. Vehicles manufactured starting in model year 1994 use R134a, not Freon. Freon is Dupont’s trade name for R12. Freon is NOT R134a! I’m an ASE and EPA certified. Plus, you need an EPA license to even buy Freon. To avoid any confusion, please remove “Freon” and add, “R134a” to your article. Hi, thanks for the comment. I’m also an ASE Master Tech with many years of experience in the automotive repair industry including AC repair starting back in the 1980’s. You are correct, since 1994 134A has been used in cars in the USA. Many people refer to refrigerant as “Freon” although you are correct in saying that 134A is not technically called Freon. This article is not a text book. Instead it is practical info relating to gauge readings from my personal experience over the years. Dupont used to own the name Freon, they spun off the division that owns the Freon name to The Chemours Company in 2015. Luckily, R134A connections are completely different from R12. And R12 is not readily available to the public. At this time anyone can purchase R134A at their local parts store without any type of license. Although it may not be 100% correct to call R-134A Freon, if you go into any parts store in the USA and ask where the Freon is, they’ll point you to 134A. Don’t believe it? Try it. Just coming home today and my a/c stopped blowing cold. Working good then not. 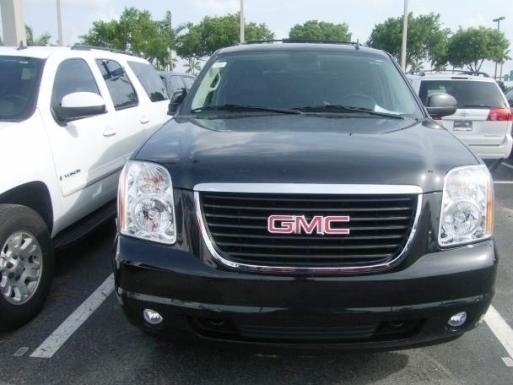 It has a static pressure of 90psi high and low, even with the truck running and the a/c on max. I think it is a faulty compressor. Your comments please. Compressor is not cycling. Rick if the compressor is actually turning, then yes the compressor is not pumping. I’d make sure the clutch disc is turning to verify though. Good Luck. Ron, it’s been a long time since I worked on R12. Thought most were converted to 134A by now. You may want to check in a Corvette forum for help on the service port connector. Good Luck. I’m pulling my hair out. Replaced compressor last fall. Worked very well until winter came then didn’t use it. First hot day it did not work at all. Clutch will not engage. Tried jumping the low side plug. Will not engage. Ran an external 12v and ground from the battery and it worked well, it engaged and cooled. I’m getting 12v to the low pressure switch on the drier. 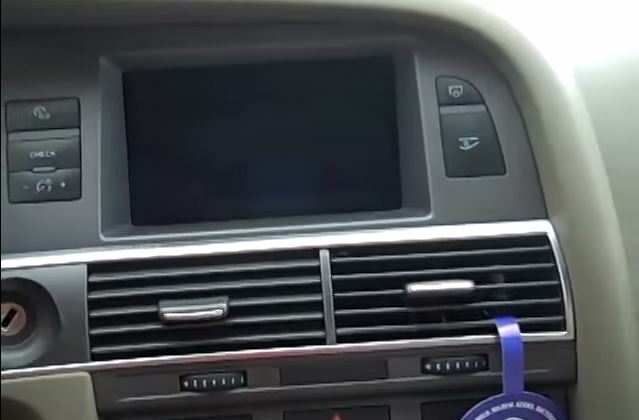 Replaced dashboard controls, no difference. Static pressure is 95 on both sides. Both high and low switches are new as well as the drier last year. I also replaced the oil pan and starter last winter. I went through the wires, don’t see anything broken. Any thoughts? I may have found it. The high pressure switch is broken. I will order a new one and see what happens. That was the problem. The high pressure switch plug was broken but still plugged in. I ordered and installed a new one and the compressor engaged. Thank you so much for your help. You have helped me a lot in the past with complicated A/C problems. Perfect. Glad I could help.